The topic of hair removal (especially facial hair) is a fairly awkward one. In fact, I remember my first experience with it quite clearly... I was maybe twelve, thirteen tops, when my best friend told me she tweezed her eyebrows. I had never taken any real notice in my eyebrows up until that point (I should note that I was also a self-proclaimed "tomboy" at the time who refused to brush her hair and once painted my nails green and brown because it was the color of dirt - oh boy) but figured if my best friend was doing it I should try it out too. Long story short, after plucking out one single hair my eyes teared up and I promptly chickened out. And that was about it until I discovered the joys of waxing in high school (and, later, discovered threading in college). While threading will always be my number one go to for eyebrows, there's still the unaddressed topic of the more, shall we say, awkward facial hair. You know what I'm talking about (or, if you're genetically blessed, perhaps you don't), the unwanted hair above your lips and sometimes around your jawline. As someone whose hair grows incredibly fast and incredibly dark, it can often leave me feeling super self-conscious and embarrassed. For years, I've been getting this unwanted hair waxed or threaded, a task that's cost me a fortune over time. So when I was offered the chance to try out an epilator I approached it with an open mind. For those of you who don't know (which was me up until about a week ago), an epilator is an electrical device that's used to remove hair by grasping multiple hairs at once and pulling them out. Basically it's like multiple, super quick tweezers. 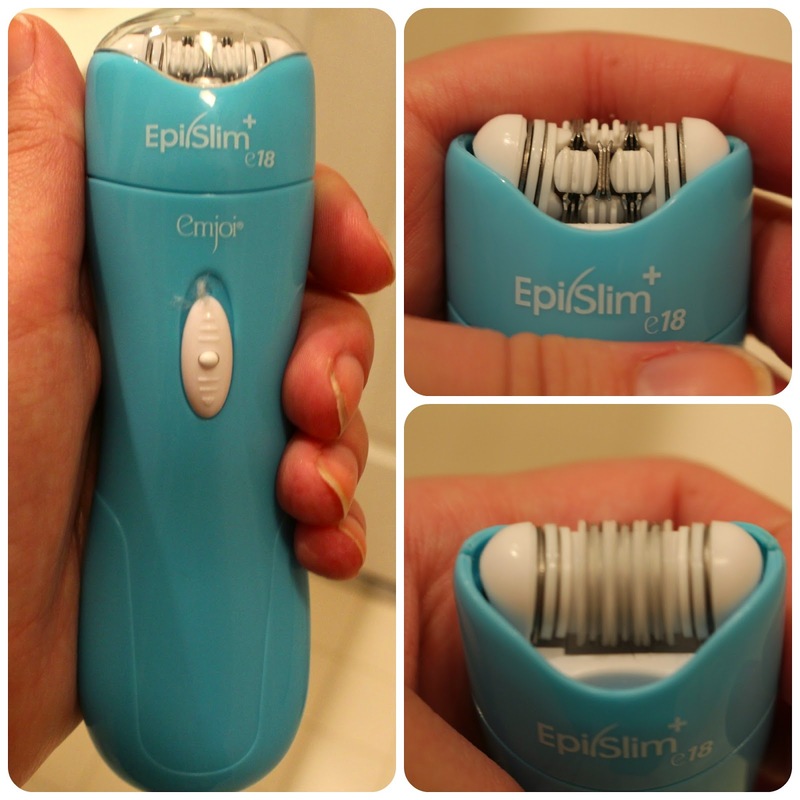 The epilator I tried out was the newly released Emjoi EpiSlim+ e18*, a compact epilator in a gorgeous bright blue. Since I'd never used an epilator before (and I have a terribly low tolerance for pain) I read the instructions several times over. You're supposed to start with clean skin and then hold it taut as you run the epilator in circular motions over any spot you want to remove hair. There are 18 tweezers in a rotating disc that work to "comfortably" pull out any unwanted hairs, leaving you hair-free for up to six weeks. The verdict? Honestly, I found all of this to be true - other than the claim that it's relatively painless. I wouldn't necessarily say it's painful, but I'd also say it's somewhere slightly north of plain old discomfort. It definitely hurt a bit, especially the first time using it. The pain subsided a bit upon further uses but never goes away completely. Other than the ouch-factor, though, I found this tool to be a real gem. I couldn't believe how well it removed unwanted hairs, all without leaving behind any painful bumps that I know I sometimes experience with waxing. I applied a little Aloe Vera after using this on my upper lip and was good to go! Since then, I've also experimented with using it on my legs. Again, the pain was there, but the results were pretty spectacular. The compact size also makes this really easy to use anywhere on the body as it can easily go over any curves or joints without causing a problem. While this guy might cause a bit of pain I can honestly say that I'm willing to get used to it for the results I've gotten thus far. Instead of spending $15 a month on threading or waxing, I'm getting the same exact results at home for less. It makes my life a little easier and my bank account a little happier - a win win! Have any of you used an epilator before? What were your thoughts and experiences? Let me know in the comments! I'm the same way! Tweezing, waxing, threading are all so painful to me, especially on my face. I won't lie, I found this guy to be kind of painful, but I was really impressed with the results! I kind of figured since it's the same pain level as the others that I might as well just go with the cheaper option - until I found some less-painful method, that is! Oh god I just saw a picture of my eyebrows today from when I was 10 or 11 and yikes I'd forgotten what they naturally look like! I find that tweezing works fine enough though... my trick is to color in your eyebrows the exact shape you want them (if you've overplucked them which i constantly do) every time you go in for a tweeze and then those hairs will grow back! Lovely blog btw!